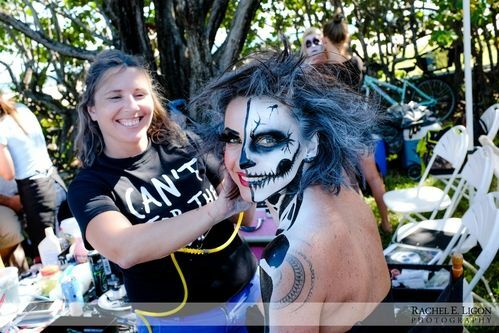 CALLING ALL KEY WEST BODY PAINTERS & AIRBRUSH ARTISTS! Sunday, October 21st to help "Zombiefy" hundreds of riders. Email Now to Be an Artist at Zombieland! Designated spaces for Artists will be painted out on the ground. 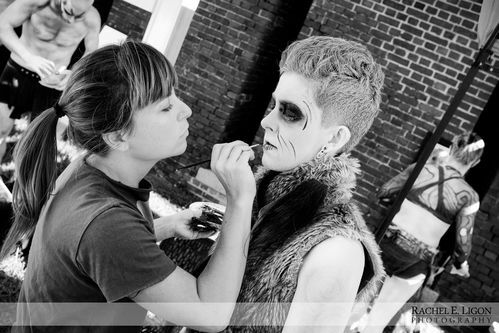 Artists are invited to start setting up and taking appointments as early as 9 AM on Zombie Day! WHEN: Artists are invited to start setting up after 9 AM. THERE WILL BE NO CAR ACCESS FOR LOAD-INS TO THE BACK LOT AFTER 12 PM ON OCTOBER 21st! AMENITIES: We will provide you with 1 table, 4 chairs, and electricity. Extra extension cords are encouraged!!! Although will provide some extension cords. Pop-Up Tents are permitted (10' x 10' MAX) but NOT provided. ART PRICES: Individual artists can set their own prices for artwork, but are encouraged to offer a simple base $10 zombie face option. NOTE! Artists are responsible for cleaning up their own work spaces at 6 PM and are REQUIRED to pay the fee IN ADVANCE of the event. Payments are accepted via credit card, check, Paypal, or cash. Checks made out to Zombie Bike Ride - and dropped off at WeCycle Bike Shop. Credit Card payments can be made at WeCycle Bike Shop. JOIN US! Email [email protected] or call (305)747-8563 to reserve your spot! *Paid Artists have first rights to choose work space at Fort East Martello.